CM Magazine: Muhammad Ali: The Greatest. (Crabtree Groundbreaker Biographies). Muhammad Ali: The Greatest. (Crabtree Groundbreaker Biographies). 112 pp., pbk. & hc., $14.95 (pbk. ), $24.56 (RLB.). ISBN 978-0-7787-1043-1 (pbk. ), ISBN 978-0-7787-1034-9 (RLB.). Ali, Muhammad, 1942- -Juvenile literature. Name-calling and hyped-up chatter before a fight were standard practices for Ali as a way to grab attention and sell tickets. His outrageous comments rarely reflected how he really felt about his fellow boxers, however. After the matches, he was gracious in victory and ready to compliment other fighters. He once praised his Canadian opponent George Chuvalo, who went 15 rounds with him without a knockout. Ali said, "George's head is the hardest thing I ever punched." He would sometimes use another colorful line to describe his opponents after a fight, by saying "He hit me so hard, it shook my kinfolk back in Africa." Cassius Marcellus Clay Jr. was born on January 17, 1942 in Louisville, Kentucky, and raised in the Baptist Church. After converting to the Muslim faith and joining the Nation of Islam in 1964, he adopted a new name, Muhammad Ali, the name being given to him by the sect's spiritual leader, Elijah Muhammad. Down smartly deals with the challenge of two names by referring to the famous boxer by the name by which he was known at the period of his life under discussion. Thus, the first part of the book describes Cassius Clay's rapid ascent as an amateur fighter, culminating with a gold medal in the 1960 Olympics in the light heavyweight category, and the early years of his professional boxing career that led to his first capture of the world heavyweight championship when he defeated Sonny Liston in 1964. 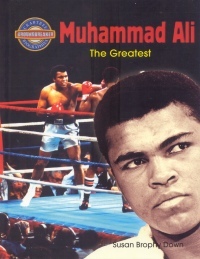 Down also documents the remainder of Muhammad Ali's boxing career that included his second and third capture of the world heavyweight title, his struggles with the U.S. government and boxing authorities over his opposition to the United States war in Vietnam, his several retirements, diagnosis with Parkinson's Disease, his humanitarian work and his legacy. Muhammad Ali: The Greatest sets the story of Ali's life within the context of the social history of the United States and the evolution of the sport of boxing. In simple language, readers will learn the basics of boxing, how Ali's technique brought innovation to the ring, and the high degree of entertainment and even branding that accompanied his boastful personality. More than once, Down notes that, prior to Ali's time, boxing had a bad reputation as organized criminals manipulated the sport in order to maximize profits from betting on the outcome of fights. Ali's story is related to the Civil Rights movement and the changing attitudes toward the Vietnam War. Topics like these are often explained in brief, but informative, insets or on pages separated from the rest of the narrative by the use of a greyed-out background. Readers interested in the history of boxing will not be disappointed as Ali's significant fights are documented and his opponents' lives are briefly fleshed out. Less well developed is Ali's family life, although his several marriages are noted and his children identified with a couple of them receiving added attention for their own accomplishments. The book is peppered with insightful quotations from people who knew Ali. Like other books in the series, this volume includes numerous appropriate illustrations in black and white, a chronology, glossary, index and lists of further resources, including books, videos and websites. The index does not include any entries for Ali/Clay. Instead, the index disperses entries about Ali/Clay under topical entries such as "family �brother Rudy ... --children" and "name change." Most of the books listed as resources are quite current and in-print but geared to an adult audience. The websites noted include helpful abstracts about their contents. Overall, Muhammad Ali: The Greatest is a good introduction to one of the most important sporting figures of the 20th century. Libraries with dated biographies of Ali should consider acquiring this up-to-date volume. Val Ken Lem is a librarian at Ryerson University in Toronto, ON.